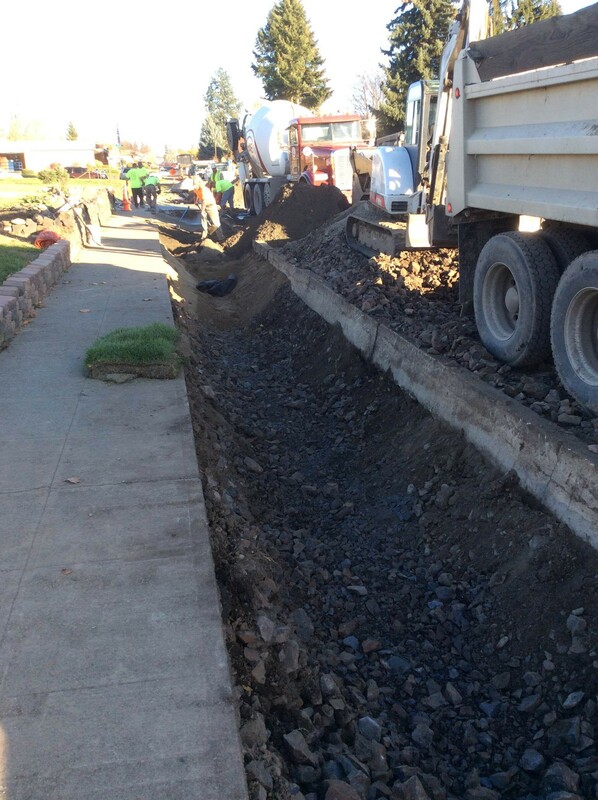 Crews work to install the three adjacent storm gardens along West Garland in the Shadle neighborhood. A new stormwater management project being installed this week in the Shadle Park neighborhood of North Spokane is designed to protect the Spokane River from harmful pollutants that would eventually discharge into its waters. About a year ago, the City of Spokane contracted with the Lands Council to find homeowners in the neighborhood who would allow storm gardens to be installed in the right-of-way strip in front of their homes, between the sidewalk and the curb. The Spokane-based environmental protection nonprofit is also overseeing the construction of the filtration gardens, and is partnering with many local businesses who've donated time and supplies toward the effort. Partners in the project include Clearwater Summit Group, Wittkopf Landscaping, Biochar Supreme, Farm Power and the engineering film AHBL. The three low-impact gardens are being installed along West Garland Avenue, between Belt and Ash streets, in front of three adjacent homes. Work on the gardens that began last Wednesday is expected to wrap up by the end of this week. Lands Council watershed program director Amanda Parrish says the filtration gardens use biochar mixed into the soil, which traps pollutants as stormwater runoff drains into the ground. Biochar is basically a form of charcoal, and has a high absorption capacity, therefore helping prevent oils and PCBs from draining into the river. In parts of the city like the Shadle area, where the city sewer system carries a combination of stormwater and sewage waste in the same pipe, mitigating the amount of stormwater going into the shared system can prevent what are called combined sewer overflow (CSO) discharges. During heavy storms, the city's wastewater treatment facility can be overloaded, so that combined wastewater instead drains directly into the river, untreated. The Lands Council was asked to help with the $30,000 storm garden project as part of the city's Integrated Clean Water Plan, Parrish says. This particular project in Shadle is serving as a pilot, and the Lands Council will continue to manage the gardens for the three years. Its staff will also test the incoming stormwater to measure the amount and types of pollutants present, and again after the water has been filtered through the engineered soil mix to determine its effectiveness. "This is a pilot project, and since the city adopted its Integrated Clean Water Plan, it's looking at as many methods as possible to make the river cleaner, faster," Parrish explains. The project in Shadle is similar in scope to the drainage swales on the lower South Hill along South Lincoln Street, but this new project required less construction. Native, low-maintenance plants are being planted in the gardens after the soil mix has been filled. Parrish says the plants also help to remove excess nitrogen and phosphorus found in the stormwater. While it's up to the city if more projects like this will be funded in the future, Parrish says the Lands Council is an obvious advocate for "green infrastructure" projects which help mitigate our impact on the river and the surrounding environment.